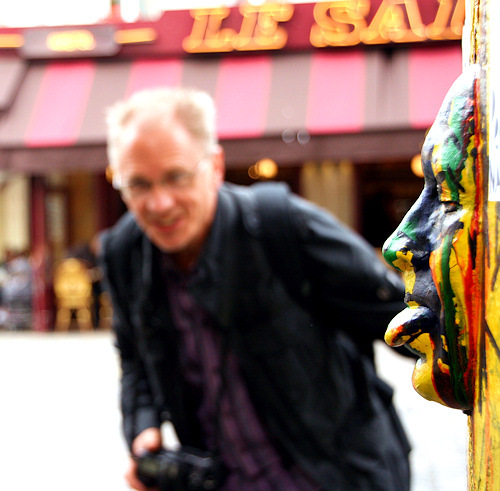 Sab's Secret Paris: 400 Quirks No.4 ~ "Advertising Space"
400 Quirks No.4 ~ "Advertising Space"
A stroll along the Rue de Rivoli at the moment offers a slightly ironic nod to the past with a resounding reminder that we're well and truly in the present. 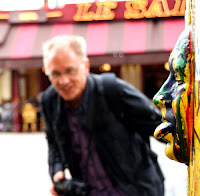 Le Moniteur de Seine et Marne has known better days! That's not quite true, because they have one of those new-fangled website thingies, and new offices just around the corner in Rue du Louvre, but this reminder of earlier days is nice and nostalgic. 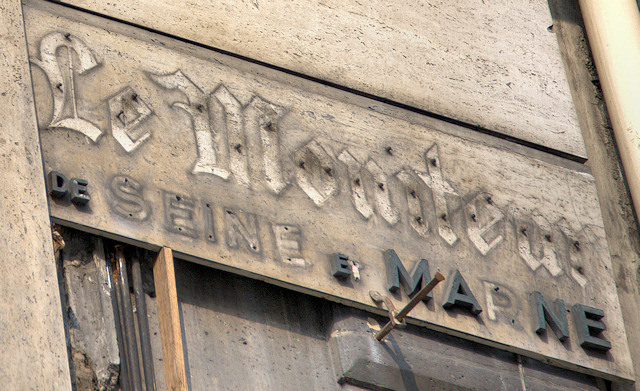 Let me respecfully point out that you're actually not looking at a sign for 'Le Moniteur' up on the wall here, but at the grime and dirt which accumulated around the letters which used to be there on the wall before being sent to some advertising rubbish pile up in the sky somewhere! Along with the last remains of the fastenings which used to keep them nailed to the wall. It's a very visible example of how our urban landscape never really stands still. If you look closely you can see that there are a handful of letters still clinging on for dear life, but their days are numbered, that's for sure. 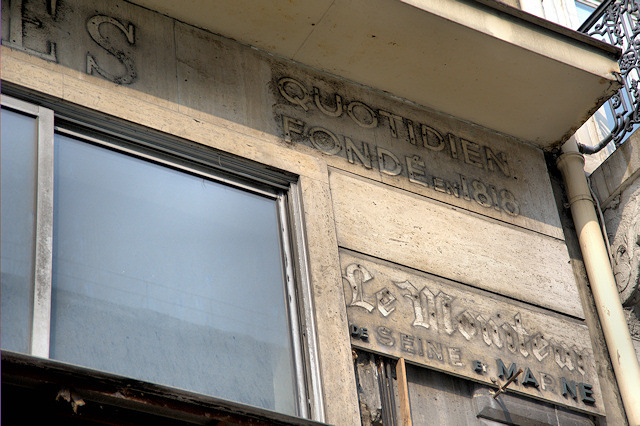 This newspaper group, Affiches Parisiennes, is actually a company which runs a group of small ads publications, of which Le Moniteur de Seine et Marne, one of the departments surrounding Paris, is one. "Imagine Napoleon checking for best routes and traffic jams on Google during his Russian campaign - why does that seem so strange..."
It's funny to think that this facade, in all its spendour of yesteryear, will have been simply part of the daily grind for so many Parisians over the decades, who wouldn't have given it a second glance, and of course, why would they? But to see it in such a state of disaffection, on the point of being eradicated forever from the cityscape, does seem to me a reason for just a few moments of contemplation. Could those little worker ants scuttling by, in 1950 say, ever have imagined a day when they could hold far more information in the palm of their hand than they could ever absorb in a million lifetimes? 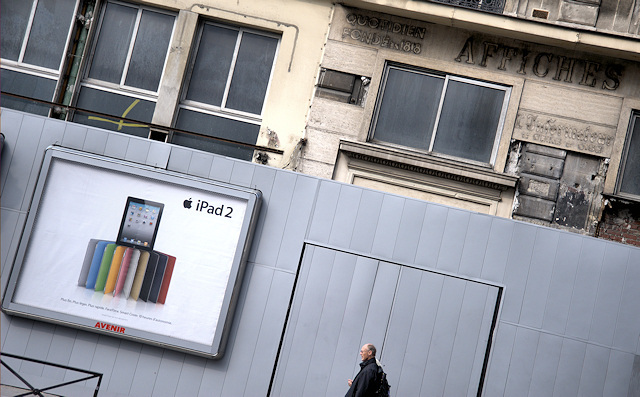 And if the iPad, for them, in an era before computers could do much more than add up a few numbers, would be quite simply unimaginable, what do you think this will look like in another hundred years, and what will the billboards be saying or even looking like? Holograms, maybe, which interact with us as we pass, based on our Facebook profiles and the latest things we have bought and done, which is automatically sent out to all of those around us as we go through our daily lives? I often ask myself, especially in relation to Paris, if change and 'progress' is always a good thing, or necessarily a sad one. New and better things come along but often replace things which have become dear to people for some reason or another. And yet without progress we would stand still and that wouldn't be possible. Which is great! Nothing is cast in stone, including our lives, and we can change them at any time. Hey! A bit of uplifting philosophical musing all brought on by a grimy old sign being torn down on the Rue de Rivoli. As it should be. The musing brought on, that is.